1, Failure cause: Hydraulic tank oil surface is too low. 2, Failure cause: The inlet pipe is seriously blocked by dirt. Solution: Take out the foreign body in the tube. 3, Failure cause: The oil pump gear oil seal damage, air into the hydraulic system. Solution: Replace aging or damaged oil seals and O - shaped sealing rings. 4, Failure cause: Oil inlet, outlet port or bend, "O" ring seal damage, bending joints, fastening bolts or inlet and outlet pipe nut is not tightened, the air into the hydraulic system. 5, Failure cause: The oil pump leakage, sealing ring aging. 6, Failure cause: The internal assembly of the oil pump assembly error, resulting in leakage. Solution: The unloading plate and sealing ring must be installed in the oil chamber, and the two axle sleeve can keep balance. The guide steel wire elasticity should be at the same time the upper and lower sleeve towards the driven gear rotating reversing the direction of a small angle, the drive gear and the driven gear two sleeve machining plane tightly; unloading groove sleeve must be installed low-pressure chamber side, to eliminate the gear meshing harmful dead volume; pressure into the self tight seal before, should be the surface coated with a layer of oil, but also pay attention to the oil blocking edge toward the front cover, not anti loaded; pump cover, to pour a small amount of hydraulic oil into the pump shell, and hand rotating gear. 7, Failure cause: "Left" installed "right" oil pump, causing the impact of the skeleton oil seal. Solution: "Right hand" pump can not install "left" machine, otherwise it will break the skeleton oil seal. 8, Failure cause: Hydraulic oil dirty. Solution: Cleaning system, replace the hydraulic oil. 9, Failure cause: The filter of the pump is blocked by dirt and can not filter oil. Solution: Remove the filter with clean oil. 10, Failure cause: The oil level is insufficient, the oil absorption position is too high, the oil suction pipe is exposed to the oil surface. Solution: Refueling to oil mark, reduce oil absorption position. 11, Failure cause: The pump body and the pump cover on both sides without paper pad; the pump body and the pump cover is not vertical seal. Solution: Inhaled air rotation: pump body and pump cover with paper pad; the pump body with emery grinding on the plate, so that the pump body and cover the error of not more than 0.005 mm, the pump body and the pump cover fastening connection, no leakage phenomenon. 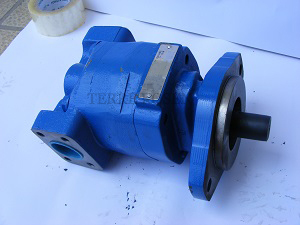 12, Failure cause: The pump shaft and motor shaft coupling is not the same, there is a distortion of friction. Solution: Adjust the concentricity of pump and motor shaft coupling so that the error is not more than 0.2 mm. 13, Failure cause: Pump gear meshing accuracy is not enough. Solution: The lapping gear achieves the gear engagement precision. 14, Failure cause: The pump shaft oil seal frame off, the pump body is not sealed. Solution: Replace the qualified pump shaft oil seal.